Description: Colleagues and former students honor Professor Jo Ann Hackett in this collection of essays focused on her interests in Northwest Semitic languages, epigraphy, and Canaanite religions of the Iron Age. Each section offers subject-specific chapters reflecting on methodology, while at the same time seeking to build connections between these three disciplines. Each contribution exemplifies the unifying theme of the collection: the continuing value and necessity of philological and comparative study of the Hebrew Bible. The contributors are Jason A. Bembry, Catherine E. Bonesho, Dexter E. Callender Jr., F. W. Dobbs-Allsopp, John L. Ellison, Steven E. Fassberg, Nathaniel E. Greene, Gordon J. Hamilton, Mark W. Hamilton, John Huehnergard, Jeremy M. Hutton, Susan Niditch, Heather Dana Davis Parker, Na�ama Pat-El, Gary A. Rendsburg, Christopher A. Rollston, Aaron D. Rubin, Jacqueline Vayntrub, and Aren Wilson-Wright. 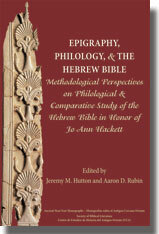 Citation: David J. Sigrist, review of Jeremy M. Hutton and Aaron D. Rubin, eds., Epigraphy, Philology, and the Hebrew Bible: Methodological Perspectives on Philological and Comparative Study of the Hebrew Bible in Honor of Jo Ann Hackett, Review of Biblical Literature [http://www.bookreviews.org] (2019).